I’m involved with various food-related initiatives in Toronto. Visiting the various programs helps me learn about food and see the kinds of programs that are available in the community. It’s also my opportunity to give back and teach people about something that I am truly passionate about. I really wanted to help out with children’s cooking classes because I believe that introducing cooking and healthy food behaviours early on can make a significant impact when they become adults. This led me to a volunteer opportunity with a program is called Growing Taste Buds at Evergreen Brickworks. It’s an 8-week program where children between the ages of eight to twelve years old learn how to cook different foods each week. Dishes range from Mexican arepas to homemade pasta to apple tarts. One of my favourite classes was when we focused on French cuisine and taught the kids how to make crepes from Julia Child’s cookbook “Mastering the Art of French Cooking”. The great things is that I actually learned how to make crepes a few months before during my French cuisine class at George Brown College and still remembered everything that my teacher taught me (i.e. letting the batter rest, the technique for tilting the pan so you get a nice round, thin crepe and how you know that the crepe is ready to when the edges start to crisp up). It also helped that I had analyzed and researched crepe recipes and technique ad nauseam for a homemade vs. store bought crepe taste test that I did. The kids took to making crepes like fish to water. 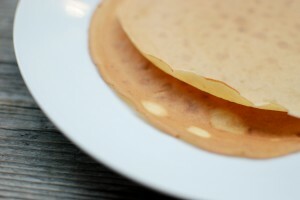 In fact, at one point I had a system going on where each kid was responsible for a specific task at the crepe station (one person greased the pan, one person poured the batter into the pan and one person tilted the pan and flipped the crepe) so I didn’t have to do anything. All I had to do was supervise! Haha! The fall semester for Growing Taste Buds starts this weekend on Sunday, September 21st and costs $160 for 8 sessions. Do you live in Toronto and are interested in helping or enrolling your kids in cooking classes? Check out the Evergreen Brickworks website for more information. Are there other kid’s cooking classes that you know of and would like to suggest? Feel free to share it in the comments below. « Omega Crunch flax topping	» What is pumpkin pie spice?